I was scanning the Daily Candy weekly deals today and came across gold leaf wall art from Brian Gainey, an LA based artist that "seeks to reduce and refine natural beauty to the essential elements of light, texture, and form." 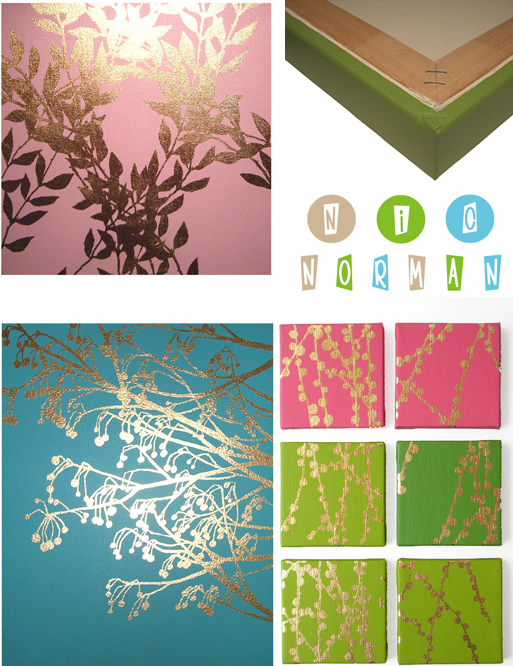 His hand gilded botancial silhouettes on canvas are sold via Nicole Lennol Normandin of Nic Norman designs, and Daily Candy readers can enjoy a hearty 30% discount! Being a silver girl myself, I'm having a hard time adjusting to the gold trend I'm seeing. Although, it's increasingly hard to resist when paired with peacock blue, fuschia, chartreuse, and turquoise. With gold being all the rage for Fall '06 fashion, I'm not surprised to see it popping up in home decor, too. From bamboo to ficus, Nic Norman will completely trick out your crib, and with that Daily Candy discount, more bling for your buck!